We really enjoyed our stay in Vitoria. It's a prosperous, modern city yet relaxed, and with little foreign tourism. The yacht club is a very comfortable place to stay, with nice bars, restaurants and shopping nearby. As usual, everyone is very friendly, though few speak much English so getting things - like gas cylinder refills and a local SIM card for the phone - takes time and patience. After a while we managed to find our way around and suss out the bus system. Bus stops are devoid of any information. Route maps - let alone timetables - just don't seem to exist. We had the same problem in Salvador. We accidentally mastered the knack of getting free bus rides - if you get on at a terminus then the conductor won't accept fares. We think you are supposed to pay to enter the bus station, and we just walked in on the road via the bus entrance! 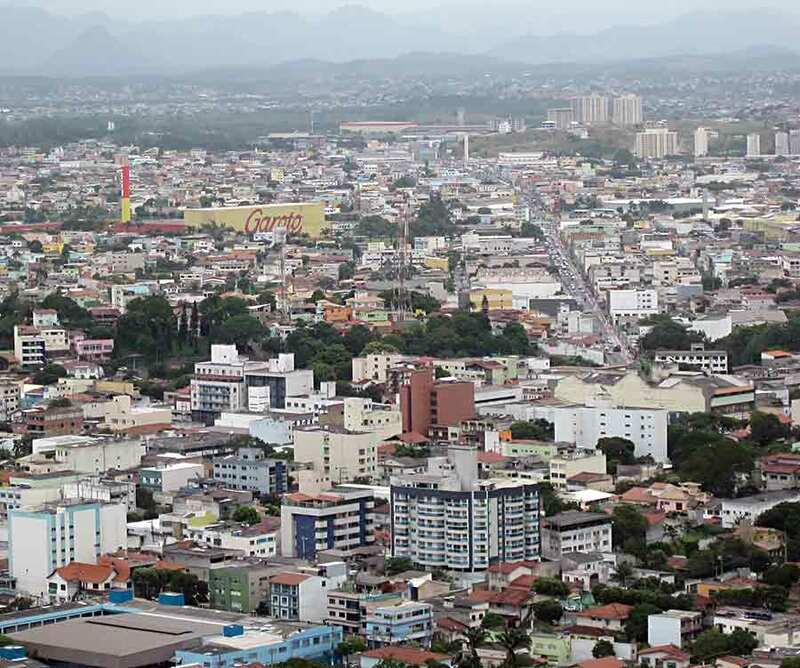 The most interesting sights are in Vila Velha - one of the early Portuguese settlements in Brazil that has grown into a large modern town just south of Vitoria. The massive Garoto chocolate factory dominates the town and the impressive Convento da Penha sits on a hill above a collection of historic buildings, including one of the oldest churches in the country. Is that the largest chocolate factory in Latin America? Let's go! We went to the chocolate factory with Swedish sailors Lisa and Sven (also staying at the Iate Clube) where we were shown round by an English-speaking guide. 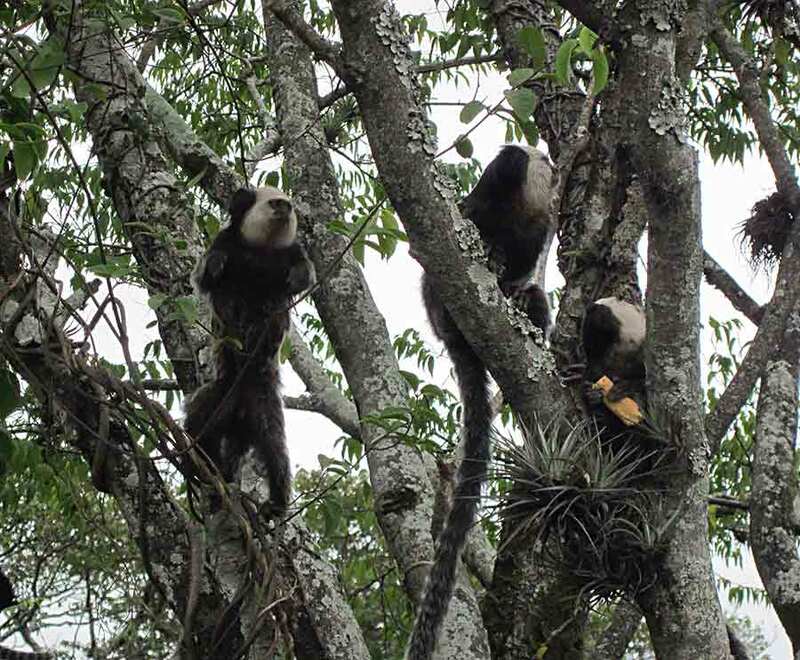 It has hundreds of visitors every day and the average age is probably about 10. The cost is only 10 Riais (just over £3) each and the over 60s are allowed in free. Having eaten our fill of the sample chocolates we were then given a bar of chocolate each to take away. What a bargain! 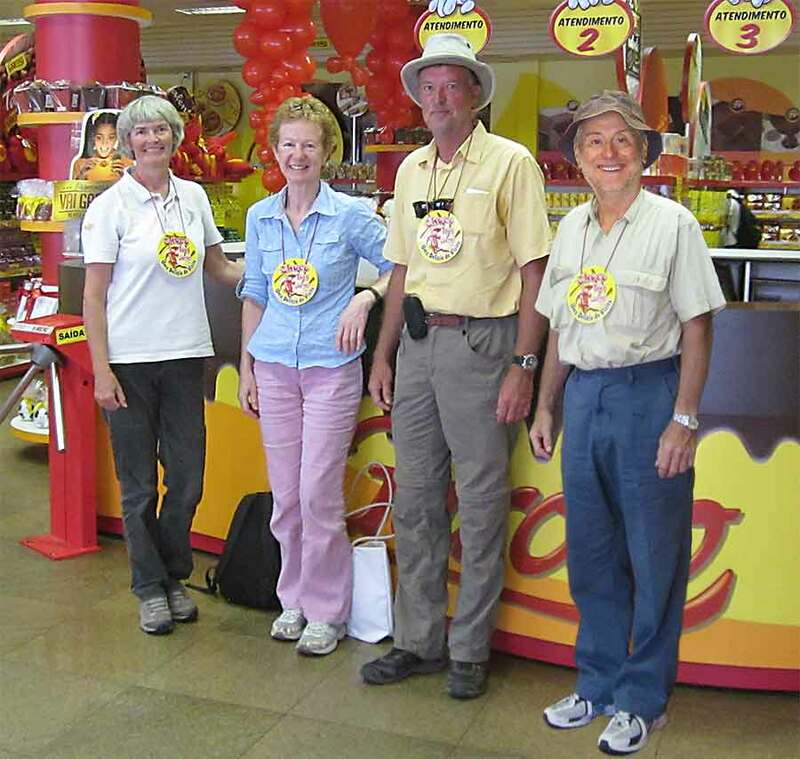 Four happy bunnies have completed the chocotour - two of us got in free! A taxi took us up the hill to the Convento where the views of the surrounding area are splendid but the walk back down a steep path through the forested hillside was hard on the knees. As we wandered around the historic area below - perhaps looking a bit lost - we were shown by a local lady into the Casa da Memoria. The curator and helpers enthusiastically told us about the exhibits in Portuguese - presumably in the hope that we might understand something. They were mostly old photos of life in Vila Velha with an old tram on the patio. When we signed the visitors' book we realised that we were their only visitors that day. Clearly intrigued by how we managed without Portuguese they then escorted us round the corner to the Homero Massena Museum. Another desperate curator sought to improve our language skills with no effect. Another visitors' book was signed for the first time that day. Every day we checked the weather forecast and compared notes with Lisa and Sven. The stormy weather passed over but the seas were rough until Sunday. We left in the morning and motored out past countless commercial ships, anchored outside the bay. The nearby port of Tubarao is one of the largest mineral exporting ports in the world - which no doubt contributes to Vitoria's prosperity. Some of the ships are also servicing the offshore oilfields along this coast. We hoped to get to our destination, Buzios, about 185 miles south, in two days. Our passage was much like the previous one from Ilheus to Vitoria. We managed to sail for most of the time but had to motorsail occasionally when the wind dropped. There was more east in the wind and we used the genaker for a bit on Sunday. This part of the coast is busy not only with fishermen but oil installations. During the day the sound of helicopters coming and going is ever present. During the night the fishermen were mostly stationary and well behaved, sometimes using flashing blue lights. The oil installations are lit up like Christmas trees and can be spotted miles off, before we pick them up on AIS. By Monday evening we'd rounded Cabo Sao Tome and changed course - to southwest. We were making good progress with the wind astern and ended up sailing with the main alone so that we didn't arrive in the dark. Why does that always happen? One change we made on this trip was in our watch-keeping routine. Normally we do 4 hours on, 4 hours off, which used to work for us, but we've been finding that the problem of sleep deprivation has taken longer to go away than before. Having read up on the subject we've decided to try 6 hour watches at night and 4 in the day. It seemed to be ok but we really need to try it for a longer passage - more than 3 days - to see if it works better than our usual system. 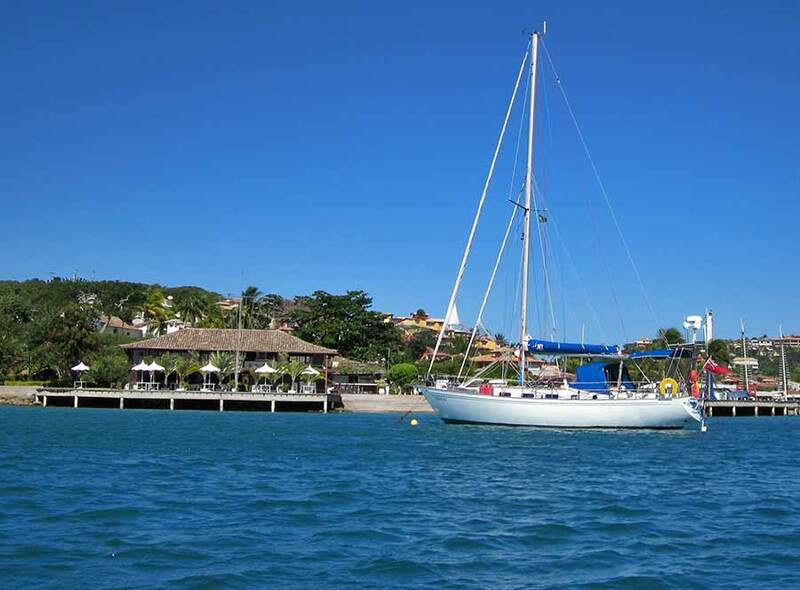 We arrived in Buzios early on Tuesday morning and are now on a mooring near the yacht club. Being low season there's plenty of space and we're looking forward to spending a few days here while yet more stormy weather passes over. Buzios is a very pretty place that became trendy as a result of Brigitte Bardot's visits in the 1960s. The town is full of bars, restaurants and bikini shops.